Is the "death care" industry — in the United States alone an $11 billion-a-year effort supporting more than 20,000 funeral homes and around 105,000 jobs — flirting with death itself? It&apos;s an industry which every year buries millions of tons of valuable resources — wood and metal coffins, and concrete grave liners — along with embalmed bodies containing countless gallons of toxic formaldehyde. Traditional burials have long been that way, but in today&apos;s eco-conscious world, it&apos;s a system that leaves the funeral industry seeming to be increasingly out of step, complain those who favor greener, more natural ways of burying people. That may explain in part the growing popularity of cremation, which the National Funeral Directors Association says is the preferred option of more than one-third of clients in the United States, and one widely quoted study says that number is growing. In England, that figure currently is more than two-thirds. But cremation, with its discharge of the greenhouse gas carbon dioxide and other airborne pollutants, including a few nasty ones like mercury vapor from teeth fillings, is not especially kind to the environment either. Instead, more people are turning to natural burials, typically much simpler than traditional ceremonies. Bodies are preserved with refrigeration or dry ice rather than embalming; cotton shrouds and biodegradable coffins replace metal or ornate wooden caskets; and the body is placed in a shallow grave instead of deep inside a concrete vault. And burials take place not in a traditional cemetery, but in a natural area destined to be protected and preserved for posterity as a woodland or nature reserve. In the summer 2004 edition of Generations, the journal of the American Society of Aging, psychologist, playwright and academic Robert Kastenbaum put an almost rhapsodic spin on green burial in an introductory essay titled, "Why Funerals?" Quoting in turn Abi Holmes, a modern woman who makes willow coffins, he wrote: "(Green) funerals are to be removed from the technological-commercial matrix and put in the service of &apos;producing wildlife habitats and forests from green burial sites, where native trees, wild flowers and protected animals are encouraged ... meadow brown butterfly colonies, grasshoppers, insects, bats, voles and owls to multiply ... where the mechanical mower does not prey on a regular basis and a self-supporting ecosystem can evolve.&apos;"
Rupert Callender, who owns the Green Funeral Company, in southwest England&apos;s Devon, believes natural burials will grow to become the dominant type of burial in the U.K. "within the next 20 to 30 years." That&apos;s a startling claim given Callender&apos;s own admission that green burials were considered "a bit faddy" as recently as a decade ago and today still account for perhaps just 2 percent of all U.K. burials. 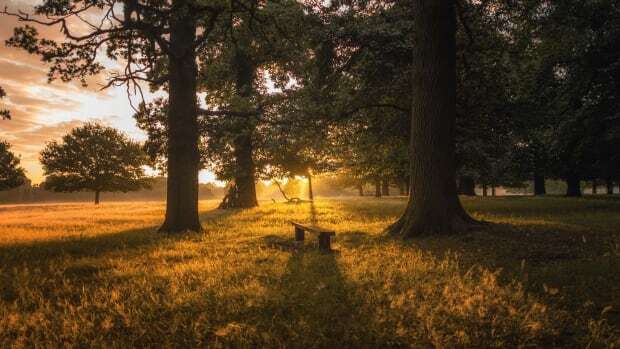 However, Callender, one of only a handful of green funeral directors in England, says around 250 natural burial sites, averaging three or four acres each, are now operating and "new ones are opening up on a monthly basis." "The U.K. put green burial on the map," said Joe Sehee, who is widely credited with doing the same thing in the U.S. when he founded the Green Burial Council in 2002. The trend has not escaped the attention of the death care industry, which believes going green could be critical to its own survival. "Green funerals are an emerging alternative to the funeral services we&apos;re used to providing," notes the association Web site. And while there are differing points of view over things like the best way to ensure burial sites are permanently preserved and whether to allow the burial of any embalmed bodies, observers see the trend line pointing up. Sehee, whose Santa Fe-based council is working to produce a set of standards and operating procedures for natural burial sites, believes the movement is gaining momentum "more quickly than any of us anticipated." By 1998, the first such U.S. site had already opened at Ramsey Creek, S.C. Today, he said, there are about 20 of these areas with another 30 or so in the pipeline and expected to come "online within a year." While the rate of green burials has not been measured, proponents feel the curve will resemble that of cremation, which after a slow start in 1876 has grown dramatically since the "cremation boom" started in 1963. Mary Woodsen is president of the board of trustees of Greensprings Natural Cemetery Preserve, which opened in 2006 and remains the only natural burial ground in New York state. She links the rise of natural burials to baby boomers, the post-war generation that she says embraced "natural childbirth, home schooling and natural foods." "We now have cradle-to-grave options for natural living, and we&apos;re taking care of the grave end of it," she says. "People want their choices in death to reflect their choices in life." According to the NFDA, funerals average around $7,000 with perhaps another $3,000 for a plot and cemetery-related costs. 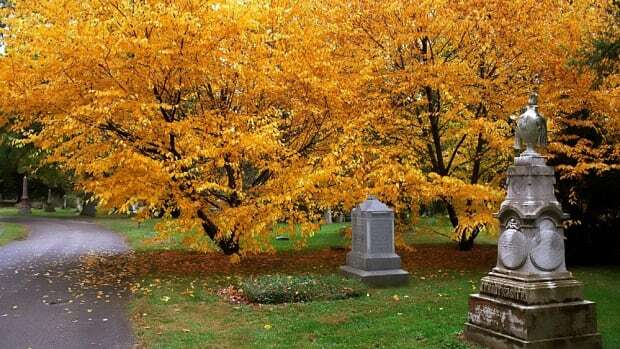 Cremation typically costs significantly less, while natural burials tend to be even cheaper: Greensprings charges $750 for a lot, plus $600 for opening and closing the grave. As the economic downturn tightens its grip, Sehee says people feel bad about blowing $4,000 on a box that they are going to use for two days and then bury. However, he senses stronger social and philosophical forces at work than just economics. "I believe what we&apos;re seeing is a paradigm shift in death care. We have been impeding the natural cycle with sealed caskets, burial vaults and bodies full of chemicals. 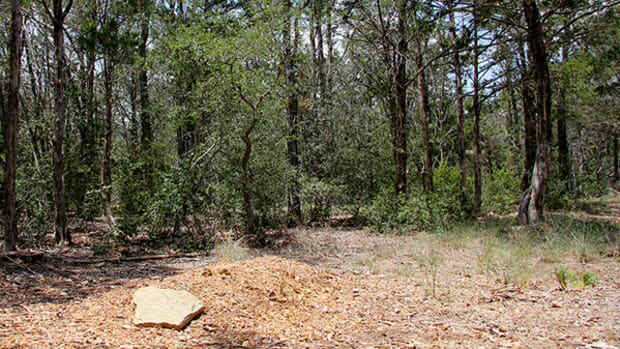 Green burial also invites people to participate in a way conventional burial does not." Lisa Auble agrees. She&apos;s a funeral director in Lansing, close to Greensprings, where she has helped with about 20 natural burials. "It&apos;s how the early burials were," she says. "Very simple, very natural, very moving." These sea changes in burial practices come at a time when U.S. death rates are steadily climbing — provisional figures from the National Center for Health Statistics shows 2,449,000 deaths for the year ending July 2008. This compares with a provisional figure of 2,415,000 for 2007 and a final tally of 2,426,264 for 2006. And as natural burial begins to elbow its way into the mainstream, those in the death care business are starting to adopt green practices and work with families wanting an eco-friendly final journey for their loved ones. "I think they&apos;re coming to see this as an extension of their core business and not so much as a threat," Sehee says. "This is not a way to circumvent the death care industry. We want to green up the whole industry. What we don&apos;t want is for it to become a marketing gimmick." Results from two recent surveys — one in 2007 by AARP and one last year by funeral industry publishers Kates-Boylston Publications — suggest only limited awareness of green or natural burials but a willingness to find out more and consider the option. The Green Burial Council is about raising awareness and giving people choices while addressing the practical issues surrounding natural burial sites. "A lot of dots have to be connected," says Sehee. "Our standards are evolving, and they should be. We don&apos;t claim to have all the answers." Embalming with formaldehyde temporarily preserves and sanitizes a body. However, NFDA spokesman Michael Krill, who owns three funeral homes in Ohio, says it&apos;s a family choice, not a legal necessity, and only in rare circumstances is it officially required. Formaldehyde is potentially dangerous for those handling it and for its effects once in the soil. Dr. Michael J. Thun, vice president emeritus of epidemiology and surveillance research at the American Cancer Society, says these risks have been researched since the 1970s. In a 2006, after reviewing numerous health-related studies, the International Agency for Research on Cancer concluded that formaldehyde is carcinogenic. 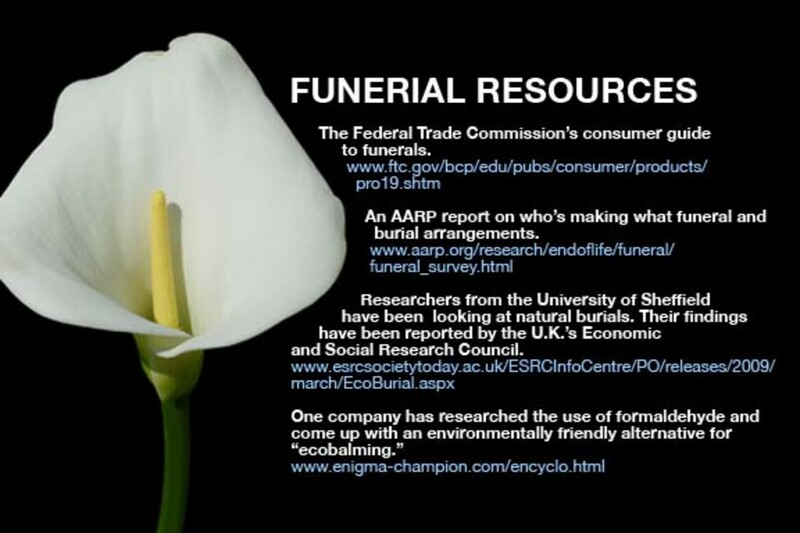 However, environmental objections to embalming may be muted by the use of new products such as nontoxic "ecobalming" chemicals being made by The Champion Company, of Springfield, Ohio, using a mix of natural plant extracts. Other steps are also being taken to green up the death care industry. Mark Allen, executive director of the Casket & Funeral Supply Association of America, says several companies now offer biodegradable caskets. Materials being used here or in the U.K. include cardboard, willow, sea grass, banana leaf and bamboo. Similarly, the Cremation Association of North America is investigating better filtration systems to reduce emissions while improving fuel and energy consumption, says association board member and environmental adviser, Paul Rahill. In addition, he says, a flameless bio-cremation process is under commercial development. Alkaline hydrolysis combines caustic soda, water, heat and pressure to dissolve a body, leaving behind a syrupy waste liquid and a similar residue as cremation. Yet another high-tech solution, from a company in Sweden called Promessa Organic, could eventually replace all current burial and cremation methods by deep-freezing the body and submerging it in liquid nitrogen. Vibration then turns the brittle remains into a fine powder that is dehydrated and any metal residue removed. The remains can then be kept or disposed of like ashes. As Kastenbaum wrote, "Beneath our whiz-bang, cybernetic, palm-pilot daily whirl we still have much in common with those who confronted death long before history found an enduring voice. Our orientation must somehow take into account both the distinctive characteristics of life in the early twenty-first century and our continuing bonds with all who have experienced the loss of loved ones. ... We can recognize that the funeral process offers an opportunity to reach deep into our understanding and values." To keep tons of steel and harmful embalming fluids out of the ground—and to save money—more and more Americans are considering a natural burial after death.